There have been far worse children’s films than Ice Age: Continental Drift, even this year, but few that make me so depressed about Hollywood’s utter contempt for young moviegoers. This is an insultingly lazy, surprisingly awful movie no parent should waste money on. There have been far worse children’s films than Ice Age: Continental Drift, even this year, but few that make me so depressed about Hollywood’s utter contempt for young moviegoers. 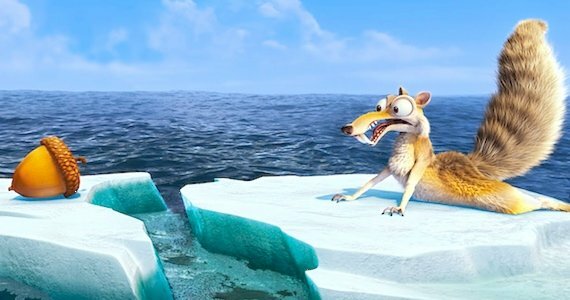 If Ice Age – a franchise that started with a genuine artistic vision and nothing but respect for its audience – can fall this far, can become this lazy, pandering, and blatantly commercial, then what reason is there to hope that anyone in this business will ever start viewing children as anything other than stupid, oblivious money-printing machines? This is the attitude behind Continental Drift, and it is an unsettling one. I imagine the digital artists put a good deal of work into the film’s admittedly complex animation, but other than that, it appears no effort whatsoever has gone into the making of this four-quel. It was produced for the sole purpose of hitting a lucrative release date and filling the studio’s coffers with the money of hard-working families. There is no artistic reason, by any stretch of the most overactive imagination, for this film to exist. It has nothing to offer children or their parents but a bland story, recycled character beats, bored humor, and inflated 3D ticket prices. No lessons, no insight, no substance whatsoever. The most a child could possibly gain from watching this film is a few cheap chuckles aimed at a goofy squirrel. I believe filmmakers must aim higher. I believe children deserve so much more. But Continental Drift is indifferent towards what children deserve. Its only concern is what parents are willing to pay, and once the tickets are paid for, the quality of the film is a non-issue. So an incredibly dull story is cobbled together about main characters Manny, Diego, and Sid being separated from their friends and family by the rapid splitting of Earth’s Continents. Never mind that Pangea split 200,000,000 years ago, the titular Ice Age depicted in these films occurred 20,000 years ago, and the continental divide took tens of millions of years to complete. Kids don’t need science! That’s for people we’re interested in educating. Stranded at sea, the trio happen upon a pirate ship captained by an evil monkey. The character is voiced by Peter Dinklage, which is cause for momentary excitement until it becomes clear that the actor has been given absolutely nothing to do but read awful dialogue with a low growl. This isn’t an intimidating villain, or a particularly powerful one, or a remotely interesting one. He’s a wet noodle, one who never seems a legitimate threat to the protagonists. Then again, the rest of the characters have long since lost their own bite. Back in the original film, Denis Leary’s Diego was a savage killer, a truly dangerous companion compelling for his questionable loyalty. Four films in, Leary may as well be voicing a fluffy bunny rabbit. The character has absolutely nothing to do, except briefly swoon over a female saber tooth tiger, a beat recycled not only from other animated films, but other Ice Age films. Manny the mammoth is even duller, and Ray Romano seems to be aware of it. Originally conceived as a brokenhearted loner, the overlong franchise has turned Manny into a boring old family-man whose biggest internal conflict is whether or not he should let his teenage daughter hang out with other mammoths her age. Let me make one thing perfectly clear: I will never, under any circumstances, be even remotely interested in watching talking wooly mammoths discuss family issues. Never. It is the antithesis of entertainment. The height of drudgery. The pinnacle of lazy writing. And Continental Drift cannot stop devoting screen-time to it. By the time the mother mammoth is lecturing the daughter mammoth about how she shouldn’t change herself to fit in with the ‘cool’ teenage mammoths, I was looking for the nearest wall to bang my head against. The franchise can’t even make Sid the Sloth funny anymore. John Leguizamo seems perfectly willing to give this character his all, to deliver as many good punch-lines as they can give him, but the script leaves him high and dry. And when you can’t find funny things for one of the most iconic animated characters of the past decade to do, something has clearly gone horribly wrong. It’s more than a little astounding how awful the writing has become. Even with a story as paint-by-numbers as this, it should be possible to inject a little life into the proceedings. Nope. Every single character or narrative beat rings entirely hollow, each one borrowed from a previous Ice Age installment or Hollywood’s miniscule set of oft-used family film tropes. The dialogue is comprised exclusively of bad clichés, and every single so-called ‘joke’ falls flat on its face. There are few ways the script could be worse. I would be stunned to learn the film was produced on anything other than a hastily assembled first-draft, and not surprised in the slightest if it turned out a seventh-grader wrote that draft. The level of incompetence displayed in the writing is absolutely atrocious. But what reason does Blue Sky have to put any modicum of effort into their films anymore? Ice Age 2 and 3 proved families will pay more and more money for worse and worse films, and I’m sure Continental Drift will continue the trend. I’m not sure whether indifferent films or indifferent audiences came first, but in any case, we’ve reached a point where parents are willing to take their kids to whatever Hollywood produces for them, no matter the quality, and Hollywood continually returns the favor by dumbing down and cheapening their products. It disgusts me. It disgusts me more than any other trend in modern filmmaking, and after years of watching this industry reward loyal audiences with increasing ticket prices and decreasing quality, I’ve just about reached my breaking point. I believe kids deserve the best, not the worst. Once upon a time, ten years ago, the Ice Age franchise agreed with me. But it’s become just as dumb, loud, and flagrantly commercial as anything else. 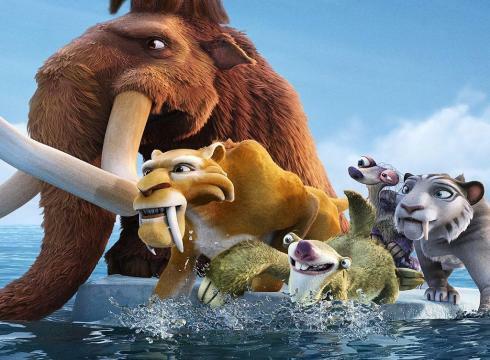 If you are a parent who agrees with my stance that entertainment should not be used to distract or babysit your children, but to enlighten and fulfill them, stay away from Ice Age: Continental Drift. Stay as far away as you can.